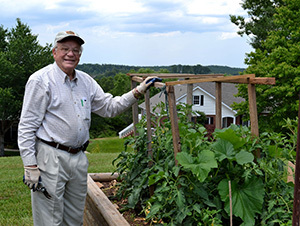 Conley Mitchell: A Gardener for All Seasons - Grace Ridge Retirement Community - Morganton, N.C. While most men give their sweethearts flowers from time to time, Conley Mitchell goes one step further. When Conley presents Millie with a bouquet, he often has grown the blossoms himself. The lifelong hobby gardener prefers zinnias and marigolds, but his real specialty is fruits and vegetables. “I’ve grown vintage varieties of several vegetables, and I once had a 65-pound pumpkin,” he said in a recent interview. 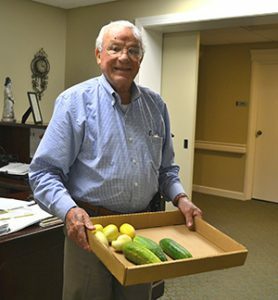 Tomatoes are a particular specialty now, and Grace Ridge residents have shared in the bounty, as Conley often puts his home-grown produce in the mail room, free for the taking. “I’ve enjoyed gardening all my life, and my family and my parents always had gardens,” he said. Although he has a pickup truck and until this year a small plot of land in town, Conley said he is strictly a gardener, not a farmer. “Farming is a business. Gardening is a hobby,” he said. A retired executive of Drexel Heritage Furniture and a Grace Ridge resident for seven years, Conley said his other hobbies are golfing and fishing. But it’s when he talks about growing fruits and vegetables that a twinkle comes into his bright blue eyes. He gets three seasons out of his garden plot; the fall produces collards, sweet potatoes and pumpkins. This year Conley is doing his gardening in the raised beds here. But besides his tomatoes, Grace Ridge residents seem to have a favorite among the vegetables Conley shares. “People here really seem to like okra,” the veteran gardener mused.